Arik Armstead Rocky Mountain Bound? As I stated in my article about the absurdity of Marcus Mariota falling to the 13th pick in the draft, NFL “experts” don’t always respect our Oregon Ducks. Mariota isn’t the only player to fall victim to this bias, with Arik Armstead being projected to go No. 28 overall in the draft. Interestingly enough, this is the same mock draft that had Mariota going No. 13, written by NFL.com analyst Bucky Brooks. Clearly Bucky has some sort of bias against Oregon players, whether intentional or not. Now, Armstead would be a great fit with the Denver Broncos, the team that owns the 28th pick. Brooks states that he “possesses the length and athleticism to be an ideal five-technique in Wade Phillips’ 3-4 scheme.” That is absolutely true, but he has the skill and ability to not even be on the board by the time Denver is on the clock. It would seem that without meaning to, he may have made the assumption that since Armstead is from Oregon he must be another raw talent who needs a lot of coaching up such as Dion Jordan ultimately proved to be. As many other draft analysts have said before me, Armstead would be a great fit for another NFL team that runs the 3-4 defense and has a need at the five-technique: the San Francisco 49ers. Because of the age of players like Glenn Dorsey and Justin Smith, the 49ers need to bring in another game changing five-technique to both provide depth and eventually replace them. 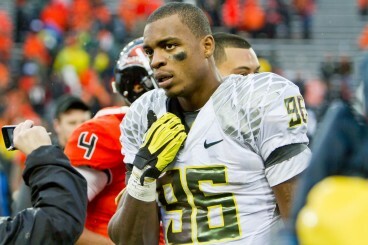 Despite both being Oregon defensive lineman, Arik Armstead is not Dion Jordan. The idea of Armstead going to the 49ers seems much more plausible, as it would put him within the top 15 picks, which is where many NFL analysts have him ranked, while sending him to a team that needs him. Other potential teams that could draft him are the New York Giants (No. 9), who are always looking to add versatile and athletic defensive lineman, or the New Orleans Saints (No. 13), who could use another talented five technique to pair opposite Cameron Jordan. The thing that we can learn from all of these so-called experts is that many of them are guessing based more on the perception of these players or their schools rather than the players’ actual abilities. 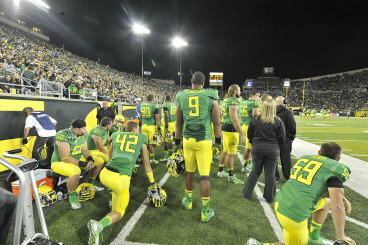 In the end they will see their mistake as more and more Oregon Ducks come into the league and show that they are not just raw fast athletes, but real football players.